Germany's chief federal prosecutor has dropped an investigation into two journalists at the Netzpolitik website suspected of revealing state secrets. The case sparked a huge political row about freedom of speech. Last week the Justice Minister, Heiko Maas, sacked chief prosecutor Harald Range. Public rallies had backed Netzpolitik. The chief prosecutor's office said it now accepted the justice ministry's assessment that Netzpolitik did not leak state secrets. But German media said investigations against unnamed state officials bound to secrecy were continuing in connection with a suspected breach of confidentiality. In February, Netzpolitik alleged that Germany's domestic intelligence agency wanted additional funds to increase its online surveillance programme. A later article in April investigated the spy agency's plans to set up a special unit to monitor social networking websites. 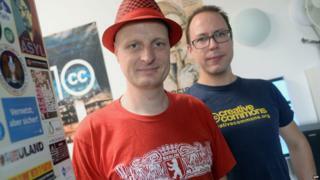 In the high-profile case, Netzpolitik founder Markus Beckedahl and blogger Andre Meister were accused of treason. The decision to drop the investigation had been "long overdue", Beckedahl said on Monday, but added that "this doesn't go far enough for us". "We want to know concretely whether, as part of the almost three-month-long investigation, we were victims of surveillance. And we want clarity about who knew what, and when, in the German government," German media quoted him as saying. He called the investigation into his website "a judicial misjudgement". "We hope that the intimidation attempt against us and all other journalists who cover surveillance activities... has collapsed big-time," he said. Many Germans were outraged by the scale of US National Security Agency (NSA) eavesdropping exposed by whistleblower Edward Snowden, who is now a fugitive in Moscow. Data protection is always a hot topic in Germany, because of the abuses inflicted by the Nazi dictatorship and the former communist regime in East Germany.